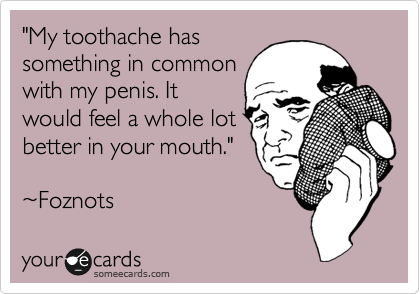 I’m sorry I haven’t posted in a while, but I’ve been suffering from a debilitating toothache. I HATE it! I’m scheduled for a root canal next week, but right now all I want to do is rip my tooth out! How can we not alleviate toothaches in one shot with all this medical science?!?!?!? Please empathize, pray and sacrifice animals for me so I get better quickly. If you’re like me, or some concept of human, you have at some point caught yourself wishing/praying for things to be different. Perhaps you lost a job or watched helplessly as your dreams got further out of reach. It could be any number of different agitations. In my case, I am my own worst enemy. In fact, I imagine most of us are consummate professionals at sabotaging ourselves. Personally speaking, I have been consumed by a personal goal for way too long. It has damaged me to such an extent that I have become myopic in my pursuit of it and I care little for anything else. I’ve forgotten how to have fun, not that I ever knew how to have any. In short, I’ve never really learned to live. Unfortunately, the dream that I was chasing in London escaped my grasp, and it took every modicum of happiness I had carved out for myself with it. Insert sad face. I did not give up. I let the betrayal take root within myself as it gave poignancy to my anger and determination. I took my obsession half-way across the world to Canada and set plans in motion to achieve that dream once again. I started, quite literally, from scratch, but today I took a big step towards achieving my dream. Then why do I still feel so lost? Instead of feeling blissfully apprehensive and comfortable, I feel recognizably empty. A feeling of deja vu skirted around inside my mind. It percolated through my body and vibrated against my bones as I recalled being down this road before. At that moment, I came to a realization about myself and my dreams. I was the betrayer, and this emptiness is my own creation. It will forever follow me because it is a critical part of me. If you live with the void long enough, eventually it starts to take over as it erodes you from the inside. As the roots of the original betrayal started to recede, I had nothing left to fill the gaping canyon that was quickly revealing itself within me. This is where this FIRST OFFICIAL POST for my new blog comes in (Hooray!). It is the first step in the right direction as I start to live again. In fact, this is the premise behind “Omne Vivum Ex Vivo.” Essentially, it means that “all life is from life.” I’ve come to believe that my dreams will remain hollow husks if they are not nourished with an appreciation for all that life has to offer. I have a dream, but not much else. I can only attain my dream if I start living a little. The life that I wish to have will only present itself if I embrace the life around me. Boredom is a terrible waste of time. I’m not looking to feel complete, but just a little less empty. The strange thing is that I will always need this emptiness because it is a well of creativity for me. This is the obvious paradox of emptiness: it is pleasure and pain. In large doses it is a purveyor of despair. But in the darkest places, it can be an antidote for the discomforts of existence that strain us all.